Changes in software delivery, tech-savvy stakeholders and project team distribution have altered the project management landscape. Today's project managers need to adapt by rounding out their portfolios with soft skills that focus on people, teams and collaboration. If you haven't redefined project management in your organization, it's time to meet the next-generation project manager. 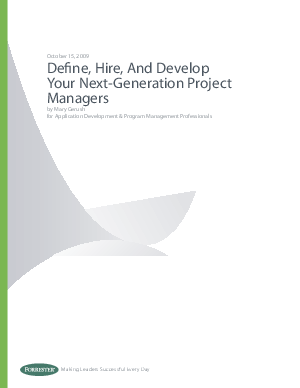 This new Forrester white paper explores the evolution of project management and outlines steps for defining, hiring and developing your next-generation project managers.